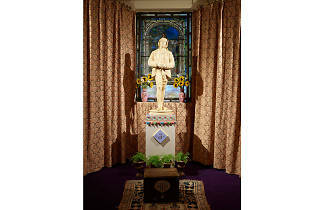 ‘The Oscar Wilde Temple’ by McDermott & McGough is one of those artworks that’s difficult to ‘review’. Not because it isn’t beautiful, wonderfully detailed, clever in its use of art history or politically poignant. It is all of those things. But because this entirely immersive installation isn’t really intended to just be art. Located at Studio Voltaire in Clapham, the temple makes perfect use of the fact that the gallery was originally a Victorian chapel. The duo has meticulously decked it out in the style of Oscar Wilde’s day, from William Morris-esque wallpaper with clambering passion flowers to sea-green stained-glass windows. Plants and flowers are found everywhere, all of them deliberately symbolic. Behind the altarpiece statue of Wilde is a large painting of the green carnations iconically associated with the writer, while huge floral arrangements of sunflowers, lilies and more lime-hued carnations adorn the stage. There are also pots of hart’s-tongue ferns, a favourite of the Victorians who loved ferns like today’s hipsters love succulents. The little details constantly delight (especially if you’re a sucker for Victoriana). On the walls are paintings fusing religious iconography with details from Wilde’s life – his trial, his mother, his lover Lord Alfred ‘Bosie’ Douglas – and every last bit of script, colour, pattern and texture has obviously been agonised over. It also smells fantastic, like old varnished wood and church incense. But the temple is more than that. On the back wall is a row of portraits: Marsha P. Johnson, Sakia Gunn, Justin Fashanu, Alan Turing… All of them punished, and in many cases murdered, for their sexual orientation. And at the other end of the space is a large book of remembrance to victims of the Aids crisis. 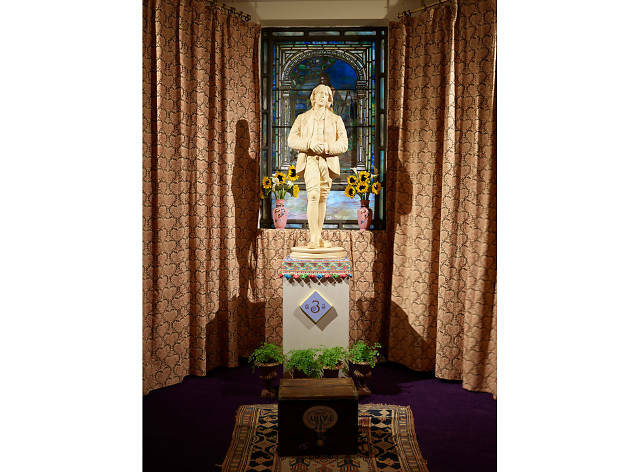 ‘The Oscar Wilde Temple’ is essentially a shrine, a devotional offering to all that LGBT+ people have endured, past and present. In this respect, it’s intensely sad, a reminder of entirely needless suffering. But that’s not the full story. Until March, the secular space is available free for LGBT+ marriages, naming ceremonies, community events and more. A fitting tribute to a man who knew how to dress for a party.